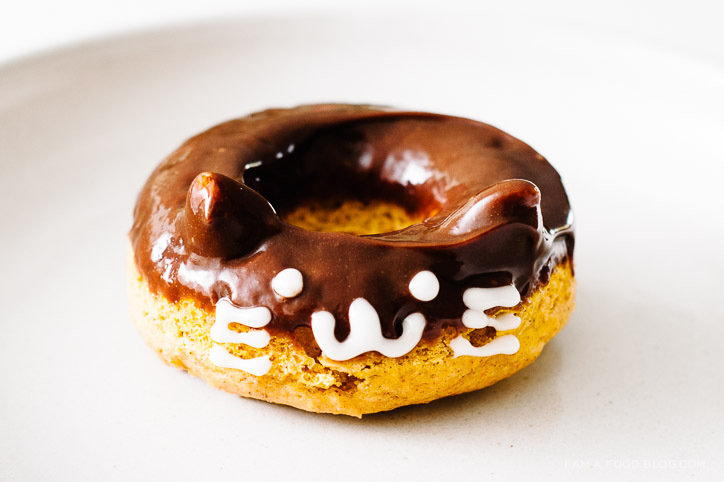 I’ve been seeing these Japanese cat doughnuts all over the internet and I knew I just had to make them, especially since one of my besties is a cat and doughnut lover. 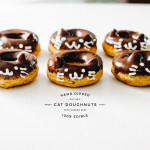 These cutie-pie doughnuts are a birthday treat for my sweet friend, Minna (Happy Birthday Minna!). I think cats are absolutely adorable. I love how aloof and nonchalant they are. But, even though I think cats are cute and I like petting them once in a while, I’m definitely a dog person. It’s funny how some people are cat lovers and some people are cat haters. I have another friend who is an absolute Hello Kitty fan, but hates cats in real life. Once, while she was having dinner with her sisters (who all hate cats) at a outdoor garden, a stray cat wandered in. All the sisters screamed and ran away, leaving my poor traumatized friend sitting at the table desperately waiting for the bill so she could pay. 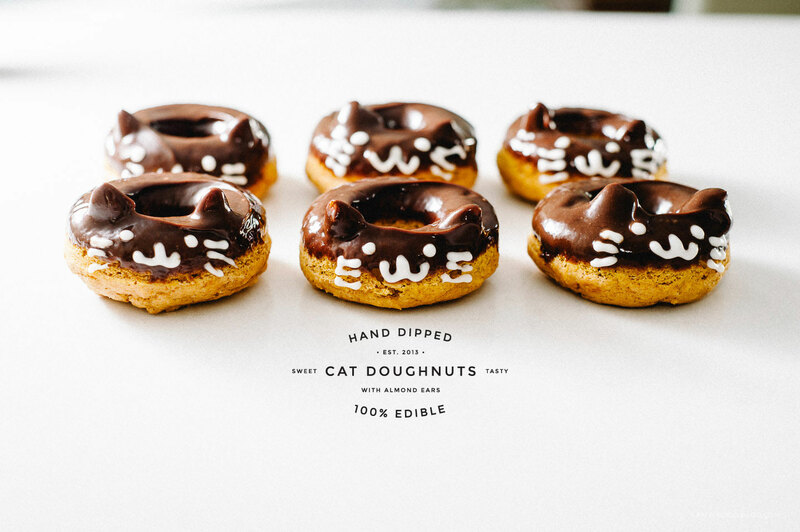 I’ve never run away from a cat before but I’m pretty sure these cat doughnuts are the kind of cats you want to run to. 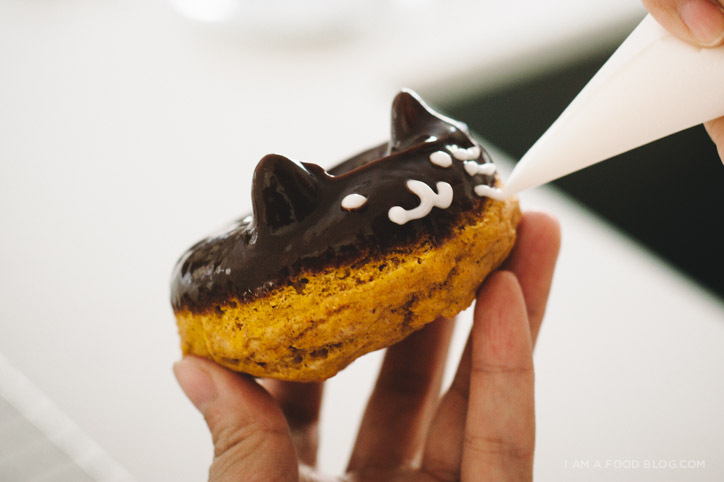 Moist and fluffy, pumpkin-spiced and topped with Nutella, these kitty cats are a super fall birthday treat. 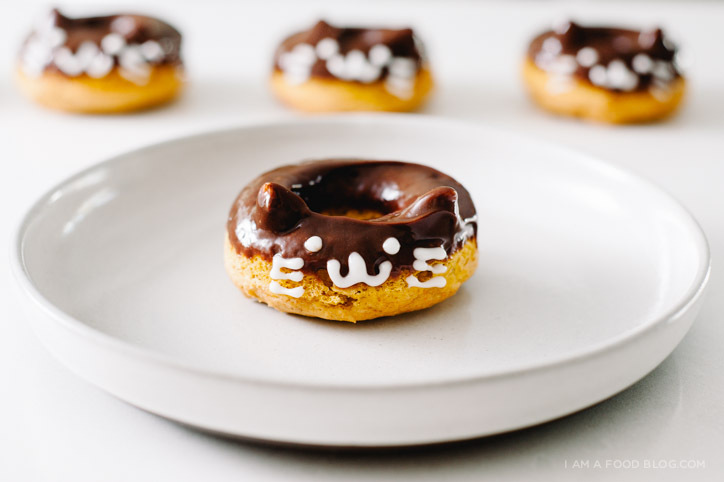 Minna, I wish we were celebrating together over giant bowls of bun bo hue, but since that’s physically impossible right now, I give you these cat doughnuts. I know you don’t like to make a big deal out of your day, but Happy Birthday! Wish we were celebrating together! Have a Meowutiful Birthday Minna! Preheat the oven to 400°F. Lightly grease or spray a non-stick 6 count doughnut pan. Whisk together the dry ingredients in a large bowl. 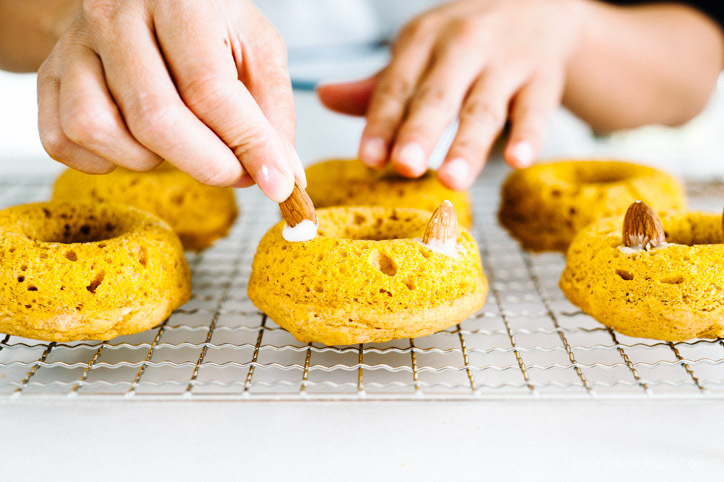 In a small bowl, whisk the sugar, egg, pumpkin, buttermilk and vanilla. Add the wet ingredients to the dry and stir until just combined. Fill the pan three-quarters full in each well. Bake for 11-12 minutes, until golden and an inserted toothpick comes out dry. Let cool for 5 minutes before turning out onto a cooling rack. Make the nutella glaze: stir the heavy cream into the Nutella. If too thick, add more heavy cream 1 teaspoon at a time. Make the royal icing: stir together egg white and powdered sugar until smooth. Dip the almonds into the royal icing and press into the doughnuts for ears. Once the almonds are secure, dip the doughnuts into the Nutella glaze and let sit until dry. Once dry, pipe on faces. Enjoy! 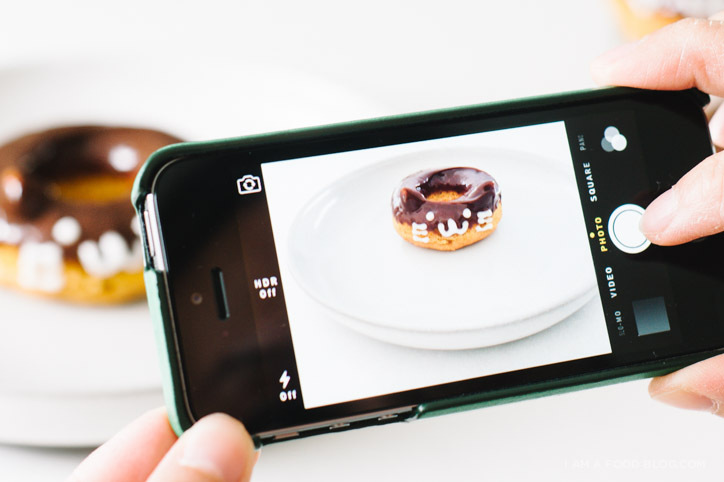 You’re right, these donuts I definitely wont be running away from…yum! These are soooo cute!! These little almond ears are the best!! Oh my gosh, the almond ears are the best idea ever. So stinking cute! AND with Nutella icing. I at first didn’t see that it was a cat face…. These are soo cute and very creative. I am definitely going to try and make these! Are the pumpkins meant to be mashed or in small chunks? It’s canned pumpkin, which is mashed/pureed. Wow! Fantastic doughnuts. Love this site. In Thailand when I was a child we had a certain type of doughnut for breakfast which has a legend attached to it.